We are counted among the well-reputed entity for providing Woodwind Saxophone. The loudest of the Woodwind Saxophone Instruments and most versatile of the brass instruments, our Brass Saxophone is used most popularly in military bands and orchestras. Commonly associated with blues, big band music, early rock and roll, jazz etc, our Professional Alto Saxophones have found a niche in all genres of music. We are offering a superior range of Woodwind Saxophone. 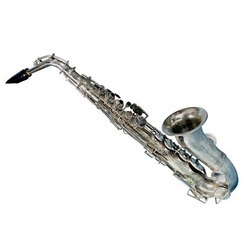 We are known as one of the leading suppliers of high quality range of Woodwind Saxophone. Our company is ranked amongst the reputed names in the market for presenting a high quality range of Woodwind Saxophone. Our reputed entity is engaged in supplying Woodwind Saxophone. We offer an exclusive range of Woodwind Saxophone. Our entity is offering an extensive series of Woodwind Saxophone. We are amongst the most reputed names in the industry, offering Woodwind Saxophone. Owing to our expertise in this field, we are offering our clients a range of Woodwind Saxophone. We are engaged in offering Woodwind Saxophone. We are the leading supplier of Woodwind Saxophone. We are a most trusted name among the topmost companies in this business, involved in offering Woodwind Saxophone.